Sit back, relax, and don’t forget to breathe. Clean the Space, Clean the Mind. I’m in love with our dark bamboo floors in the loft. I love them more when they’re flashing that clean, just polished sparkle. Say hello to our creeper dog, Reynold. I tweeted earlier that he just stares at us if he needs or wants something. Creeper dog. He’s actually pretty vocal once we figure out he needs something (haha). Anyway! For weeks we’ve been avoiding cleaning the floor. Gross, right!? 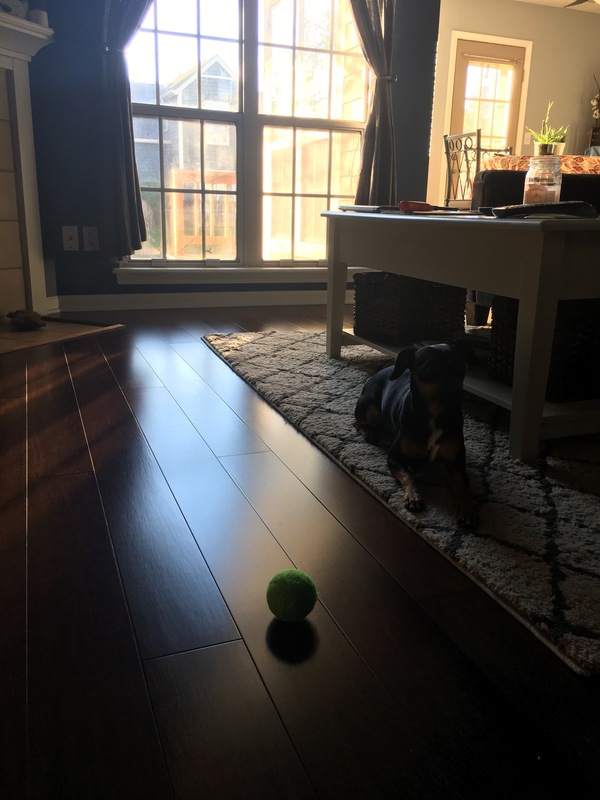 We love the dark floors, but they’re a little more to keep up with on the cleaning front. I’d rather see the dirt and have it shame me on a daily basis, than have it blending in with a lighter colored floor. People always praise lighter wood floors because they “can’t see the dirt as much.” That’s gnarley, in my opinion. We sweep the floors every week, but using the cleaner has fallen by the wayside the past handful of weeks. We don’t wear shoes inside so this helps a ton. Whenever the floors are just cleaned, I have such a feeling of relief. S and I keep a very clean space, and if things start to pile up or get too dusty, we tend to go crazy; major moods and attitudes (lol). So, I’ve been on my Mother Earth kick for the past year or so. Let’s face it, some of the changes I’ve made in my daily skincare and mental health regimen are in LARGE part to YouTube influencer/Podcaster Hey Fran Hey. From oil cleansing, meditation, and other forms of natural remedies, I continue to experience the benefits of an improved daily life. I was excited when she announced her collaboration with Spotify – on her podcast, The Friend Zone. Just listening to their conversation about music on that podcast is enough to know this playlist was going to be something serious. 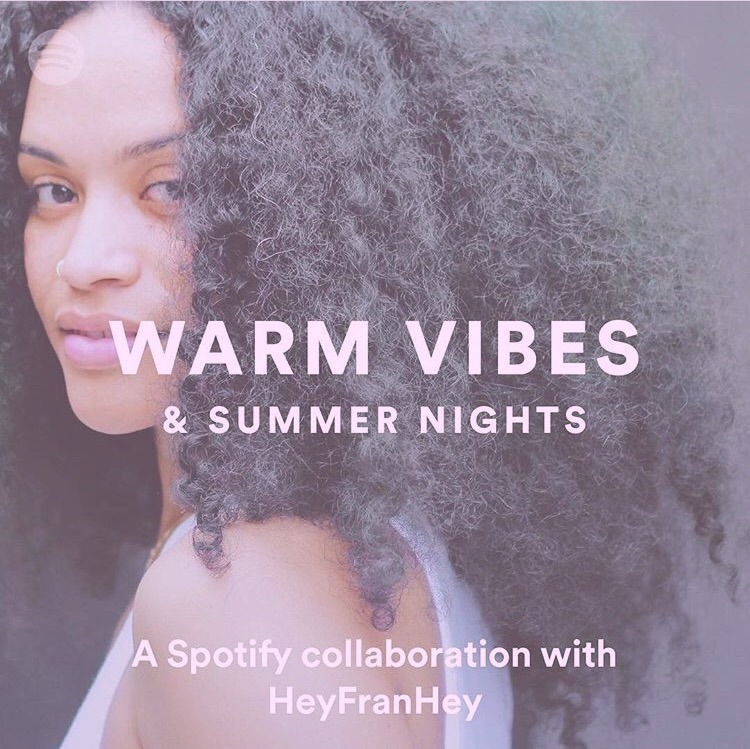 A big fan of supporting indie artists, Fran has loaded the 39-track playlist with a healthy dose of artist I had yet to experience. A new personal favorite artist of mine is Iman Omari, thanks to @HeyFrayHey. If you have a Spotify account, please give this playlist a listen! It’s perfect for some mellow vibes right before bed, background music at a house party or cookout, and even better for a romantic dinner with that special someone. Fun, light, filled with spirit and emotion, Warm Vibes & Summer Nights is what you’re looking for. The weekends never feel like weekends anymore. Indiana summer has finally arrived and we already feel like every weekend is booked. There’s never any escaping a full summer schedule when you’ve spent all of winter and parts of spring hibernating. I’ve come to terms with this and love any chance to be social nonetheless. Change has ruled the past couple months for S and I. The both of us struggled to stay engaged at our current jobs, but patience proved to be rewarding as we’ve both been promoted – and thank goodness for that. Though S is busy finishing up his master’s in accounting, we finally feel like we can breathe and make some personal progress – as in projects and hobbies – while we navigate professional success. We’ve taken to retreating to the pool after grocery shopping on Sunday mornings. The secret is getting to the pool before the neighborhood families burst zen’s bubble and steal all the good lounge areas. The sun is at its most cruel between the hours of 10am and 2pm. We show up at 11am with towels, sunscreen, and some form of low-carb-alcoholic beverage. It’s the perfect way to relax and dread Monday’s mundane arrival. Sweating out the weekend’s toxins by the pool always leaves me feeling detoxed and refreshed. S will eventually get in the water to cool off, while I continue to bake under the sun – nose buried deep in GQ Magazine most likely. I don’t avoid the water because I haven’t learned to swim. Occasionally I will take a dip and hang in the water with S and/or friends. There’s just something about hanging out by the pool, hiding behind shades, and taking an amazing power nap that complete me in those moments. Finding time for each other is extremely important. We’re great at hanging out on the couch after a long day of work, but to engage in some summertime relaxation together – even if it is only once a week – has been pretty nice. S could definitely win an Academy Award for Best Performance in the I Don’t Want Monday to Come category… I just wish I could bring my margarita along when I leave for work Monday morning.